October 21, 2018 6:54 am. John Gosden (r) has had a treble on Champions Day at Ascot to secure Britain’s trainers’ title. John Gosden has broken the dominance of Aidan O’Brien to cement British racing’s Flat trainers’ title, aided by a treble on Champions Day at Ascot. With the coveted crown having headed to Ballydoyle for the past two seasons, the Newmarket handler foiled the hat-trick after taking Britain’s most valuable race day by storm. 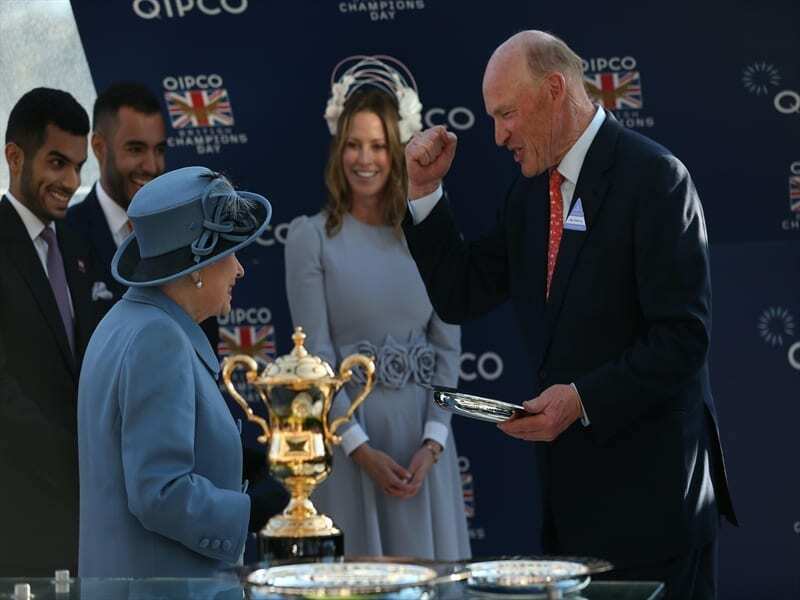 “I gave the cup to Aidan and he had to give it to me this year,” Gosden said. Wins for Roaring Lion in the Queen Elizabeth II Stakes and Stradivarius in the Long Distance Cup all but secured the title for Gosden but the best was arguably saved until last, with Cracksman recording a brilliant second success in the Champion Stakes. Arriving on the back of an odds-on defeat in the Prince of Wales’s Stakes at the Royal meeting, Cracksman returned to his best to take the Group One prize by six lengths, completing a double for Frankie Dettori, who also won on Stradivarius. “Frankie, how he got through the Houdini hole on Stradivarius, I don’t know,” Gosden said. “I thought Roaring Lion was beyond brave, as he was never enjoying the ground, but he had the guts to win it, and I thought Oisin (Murphy) was cool and didn’t panic. There have been several performances that particularly satisfied the trainer. “I think getting (Arc winner) Enable back was good, and getting Cracksman back is top class,” he said. It may be Gosden’s name that appears in the headlines, but winning the championship again has been far from an individual effort in his eyes, and one that has happened through the hard work of those behind the scenes. “You are lucky that you have great owners that send you some lovely horses. I’ve got a wonderful staff who have worked with me for many years,” he said. “It’s a good team, as it’s all on first-name terms and everyone talks to each other and everyone’s ideas are discussed. It has got to be down to those three ingredients.